Stencils allow quilters to follow a pattern as they sew layers of fabric together. Quilting stencils are guides that are used for marking layers of fabric to be quilted together with patterns to follow during the quilting process. Marking out the pattern ahead of time keeps people focused and on track while they are sewing and reduces the risk that a design will be applied unevenly. It allows people to plan out all of the patterns that will be used, ensuring that the aspects of the design fit together neatly and will be aesthetically pleasing. In quilting, layers of fabric are stitched together to create a padded finished product. These layers can be single fabric sheets or pieced sheets, where pieces of fabric are sewn together to create a pattern and then quilted with batting and a backing to create a finished product. The simplest quilting designs may consist of lines that run back and forth across the fabric while more complex versions can include flowers, geometric designs, and other patterns that will be subtly visible to anyone examining the finished quilt. People may quilt words, figures of animals, and other motifs into their work as well. Some quilters freehand, while others prefer to draw out the stitched pattern before they begin. Quilting stencils facilitate this and also allow people to create highly symmetrical and regular patterns. There are a number of different types of stencils available. Disposable quilting stencils are made from paper that is pinned or otherwise attached to the fabric. People sew right through the patterns on the paper and tear it away when they are finished. Reusable stencils consist of stiff paper, plastic, or cloth sheets with holes in them. People can use spray chalk, washable pen, pencil, and other marking tools to draw through the stencil, leaving a pattern behind on the fabric. This pattern can be followed during sewing. Some quilting stencils are specifically designed with machine quilting in mind, while others may be intended for hand quilters. 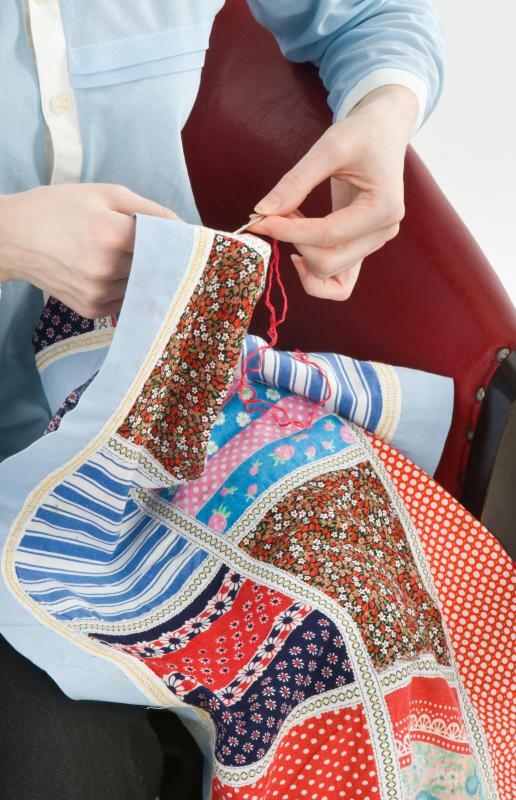 The stencil can be washed or wiped down for reuse at another time, and when the quilting is finished, the quilt can be washed to remove the markings made with the stencil. Stencils designed for edging usually have a very regular design that can easily be repeated, with decorative motifs for corners. Other stencils are designed to create standalone motifs that may be located in the middle of quilt squares or laid out in other ways, depending on the taste of the quilter. People can make their own quilting stencils by drawing out patterns and poking holes or creating slits so that chalk or another marking substance can be forced through the pattern and onto fabric to be quilted. What are the Best Tips for Using Paint Stencils? What are the Best Tips About Quilting for Beginners? What do Quilt Kits Usually Include? How do I Read Quilting Instructions?